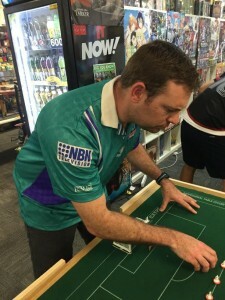 Peter Thomas swept all before him like a cyclone, as he claimed the AGFA Cup XIII, the first leg of the Sydney Premier League, at the Chatswood Good Games store, clubhouse of the Northern Falcons. 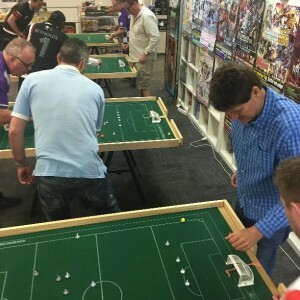 He stormed into the final winning his group, then blasted five past a bemused Neil Brener in the quarter-final, overcoming Eliot 1-0 in the semi and Dominic 3-0 in the final. 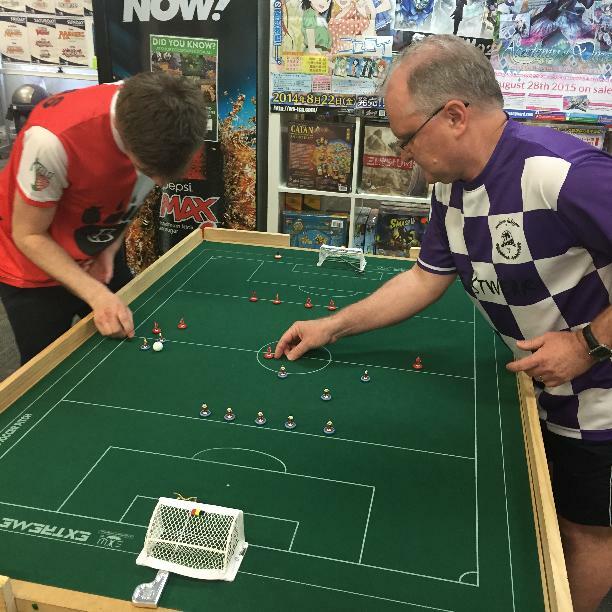 Some of his goals on the day were breathaking – the third against Steve in the group was as good as you can get with speed, accuracy and brilliant timing. Two of the goals against Neil were so fast that Neil barely had time to get a hand to his keeper after Peter started the move deep in his own half. 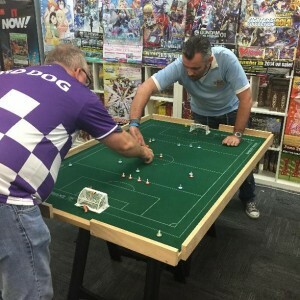 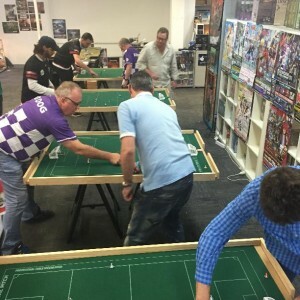 A total of 15 players contested the event, including Fox Sports’ A-League commentator Simon Hill, who hadn’t played in more than 30 years, since participating in the North West England Championships. 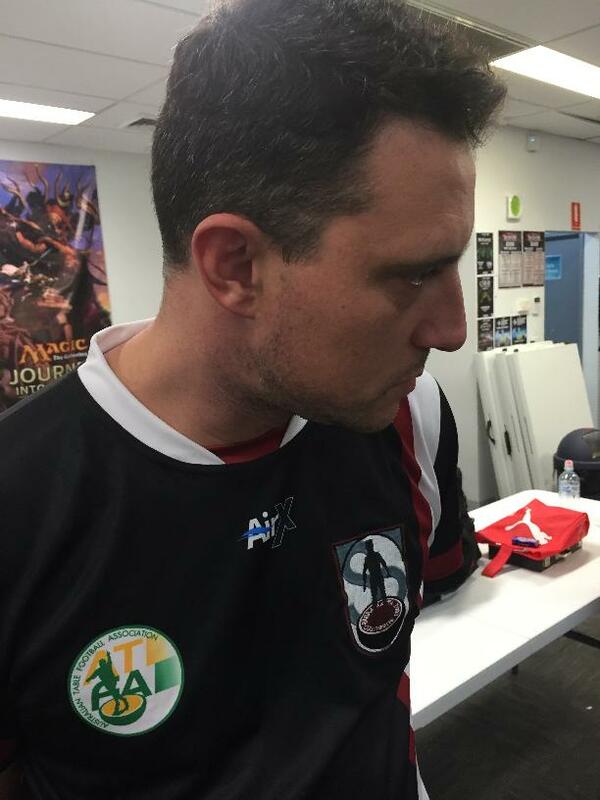 Simon surprised everyone – including himself!! – by scoring three creditable victories, including the scalp of Dom Grenot, to qualify for the quarter-finals. 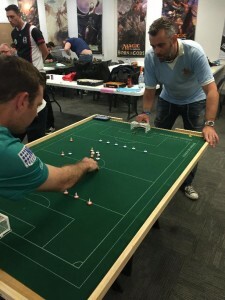 With 15 players, the decision was made to have three groups of five, to give everyone at least four matches. 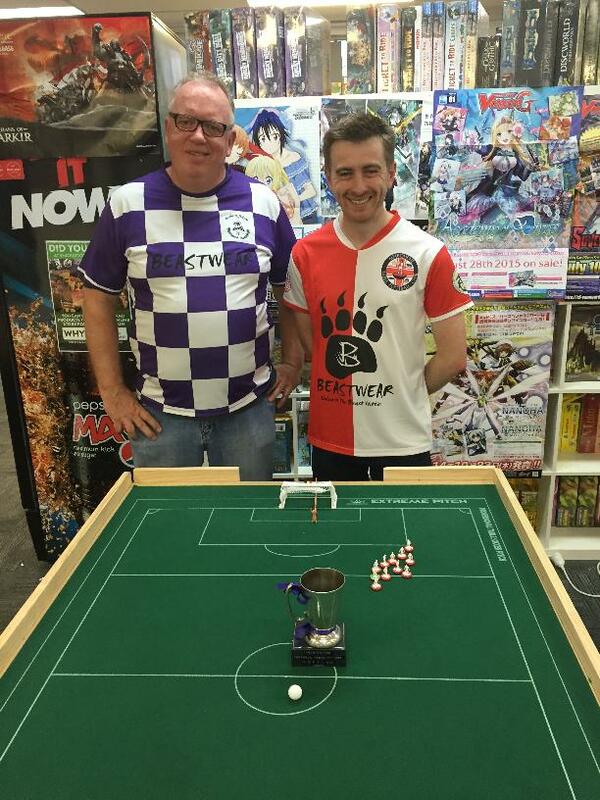 As in all AGFA Cups – this was the 13th edition, stretching back to 1977 – all draws for groups and phases were random, without seeding. Inevitably this led to some fascinating match ups. 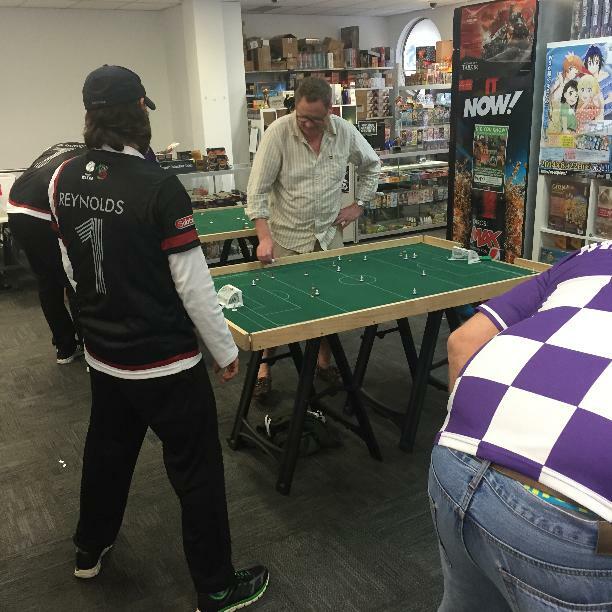 Group A was comprised of Neil, Simon Hill, Dom, Stuart Codling and Todd Giles. Group B was the so-called ‘Group of Death’ with Peter Thomas, Eliot Kennedy, Steve Dettre, Paul Magee and Daniele Lombardi. 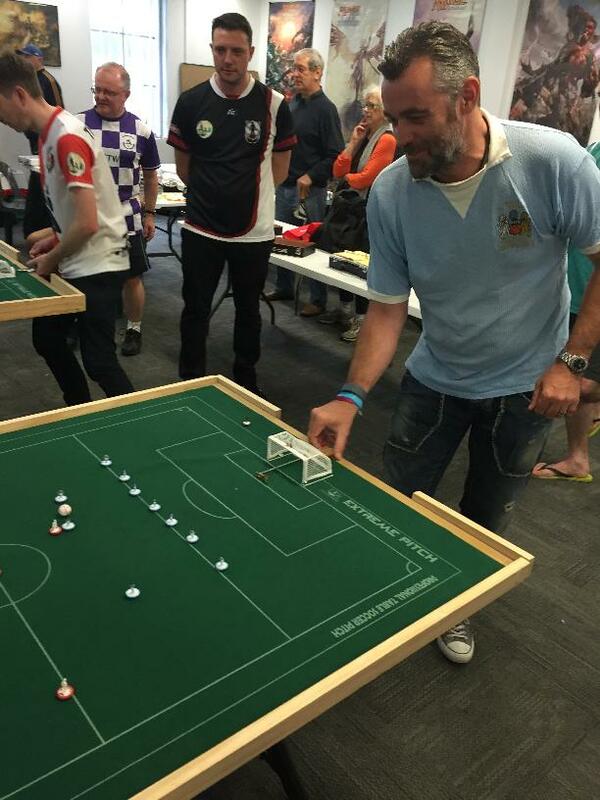 And Group C was Adam Reynolds, Matt Barrie, Johnny Ball, Simon Cole and Jonty Brener. 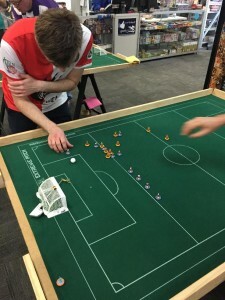 In the first matches, the games went as expected, though Peter left it late against Eliot, scoring with just 20 seconds left to eke out a 2-1 win. 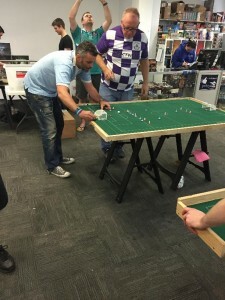 Daniele should have had four goals within the first five minute as he launched a whirlwind against Steve, but they settled for a 0-0, which Daniele repeated against Eliot. 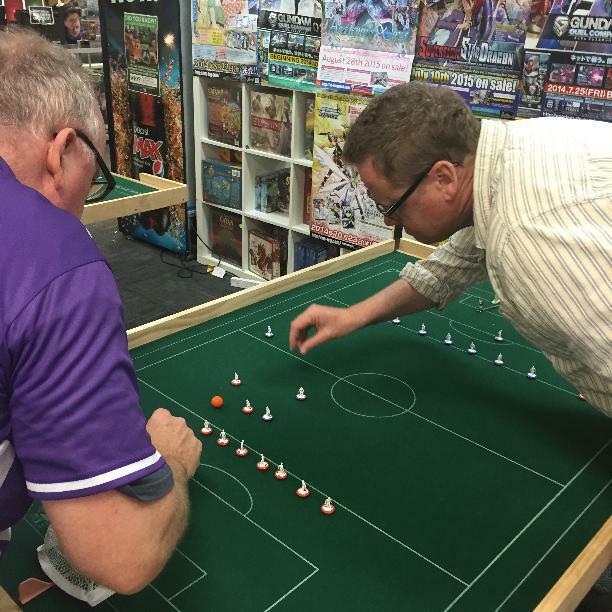 Stuart Codling is starting to get back into the rhythm of the game after many years, beating new boy Todd 1-0. 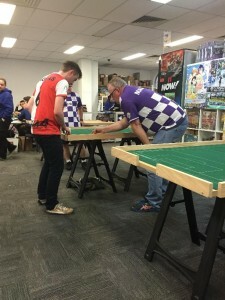 Simon Hill took one match to shake the rust out of his flicking fingers, losing 1-0 to Stuart, and then in the second game scored a notable 1-0 win against Dom. Paul Magee pushed Peter all the way in their encounter before Peter won 1-0, but then Peter exploded in a scoring rush to beat Daniele 4-0. 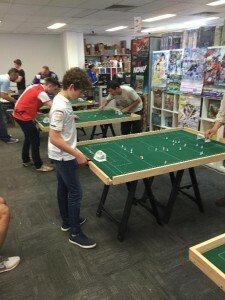 Eliot and Steve drew 1-1, and Johnny and Adam drew 1-1, leaving Groups A and C with the best chance of getting the two best third place qualifiers for the quarter finals. 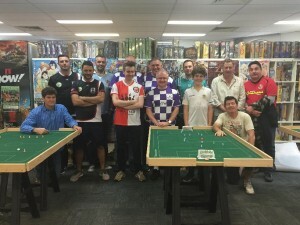 When the dust settled, it was Neil, Simon and Dom from Group A, Peter and Eliot from Group B, and Adam, Matt and Johnny from Group C who made up the final 8. Peter swept Neil 5-0 as mentioned, while Dom had sweet revenge against Simon Hill, scoring within the first 20 seconds and holding on to win 1-0. 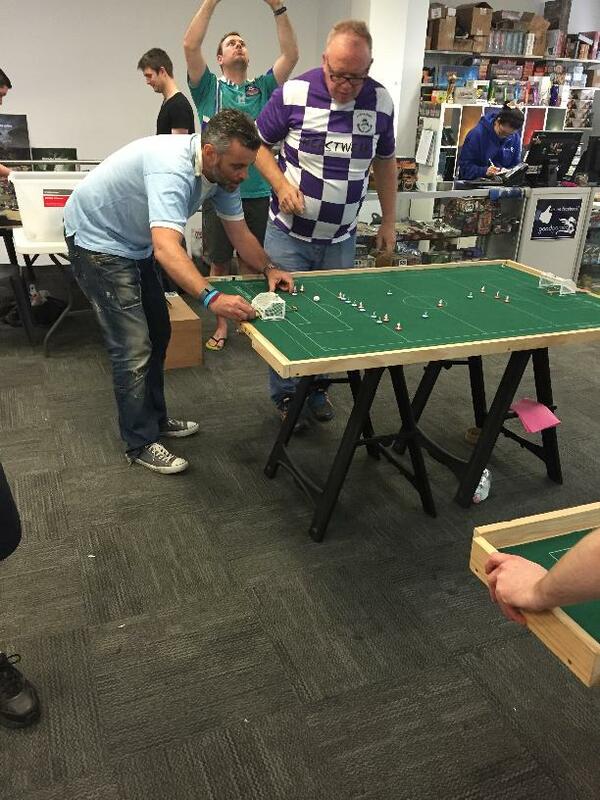 Johnny beat Adam 1-0, and then Eliot eliminated Matt 2-0. 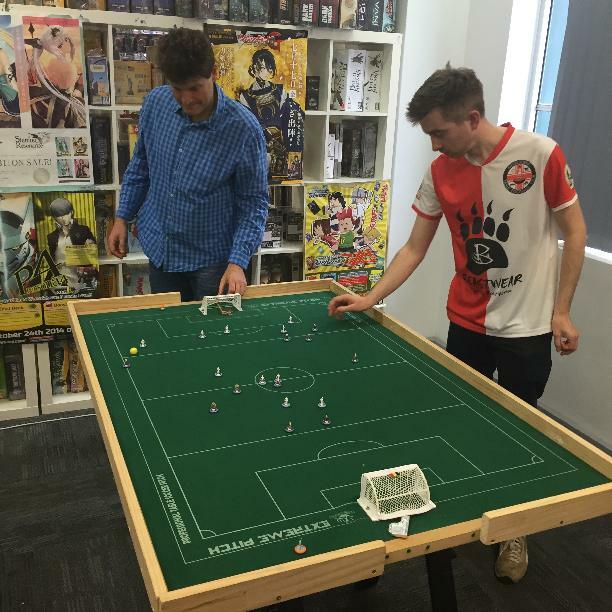 In the free draw for the semis, it was fate that pitted Peter and Eliot again, with Peter drawing on all his attacking and defensive skills to overcome Eliot 1-0, while Dom beat Johnny 1-0. 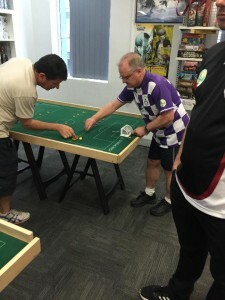 In the final, it took Peter only 26 seconds to take the lead, with two more within the first 6 minutes, before Dom managed to get some possession. 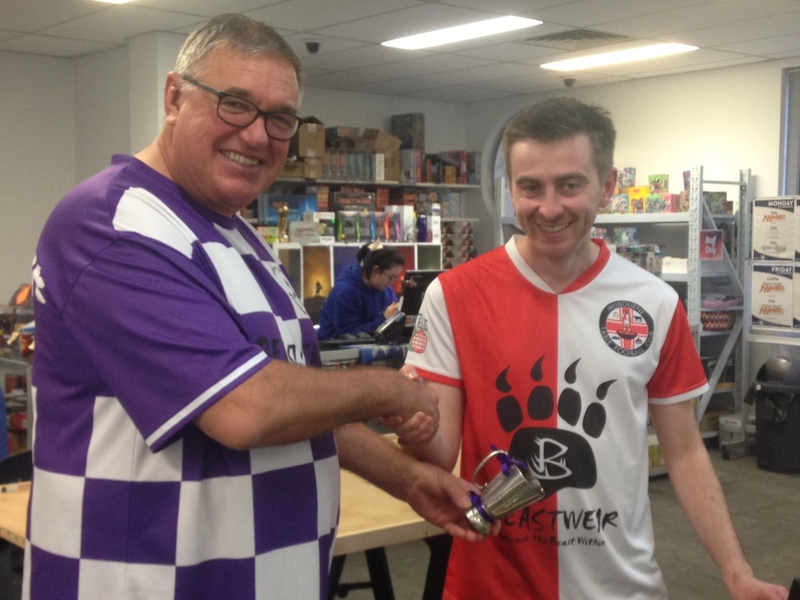 Peter’s victory made him the winner of AGFA Cup XIII, and he now tops the Sydney Premier League standings. 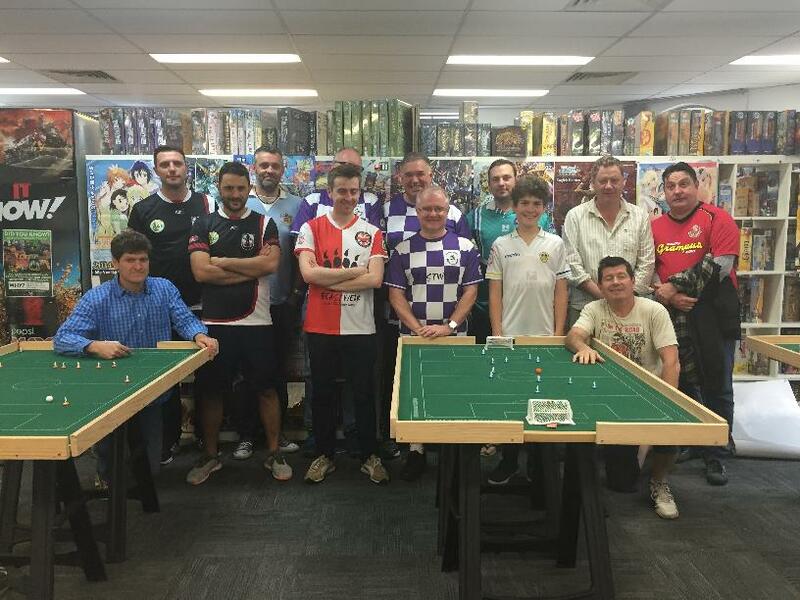 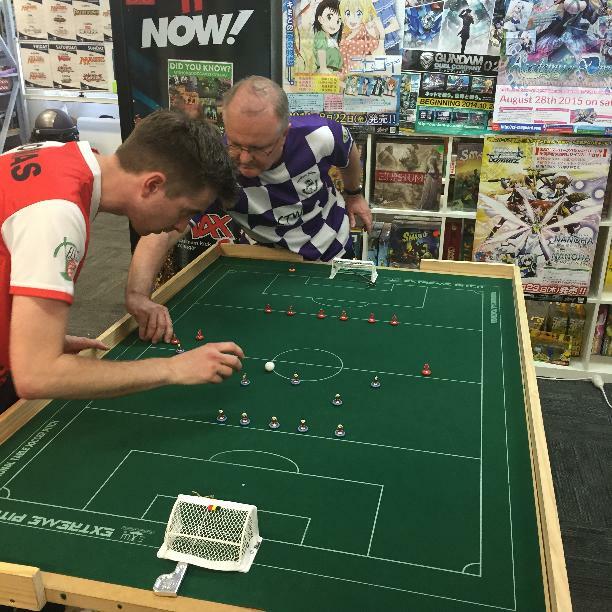 Big thanks to Peter for making the trek from Canberra for the day, to Simon Hill for making the first of hopefully many appearances on the table football board, and to Paul Magee for treking in from Katoomba. Also a special thanks to Andy & Andy at the Good Games Chatswood store for letting us use the space, and for Rachel for letting us in early to set-up. Simon Hill’s wife Stephanie Brantz, ABC sports presenter, was on hand to record Simon’s performance! This entry was posted in News on 24/08/2015 by Steve Dettre.